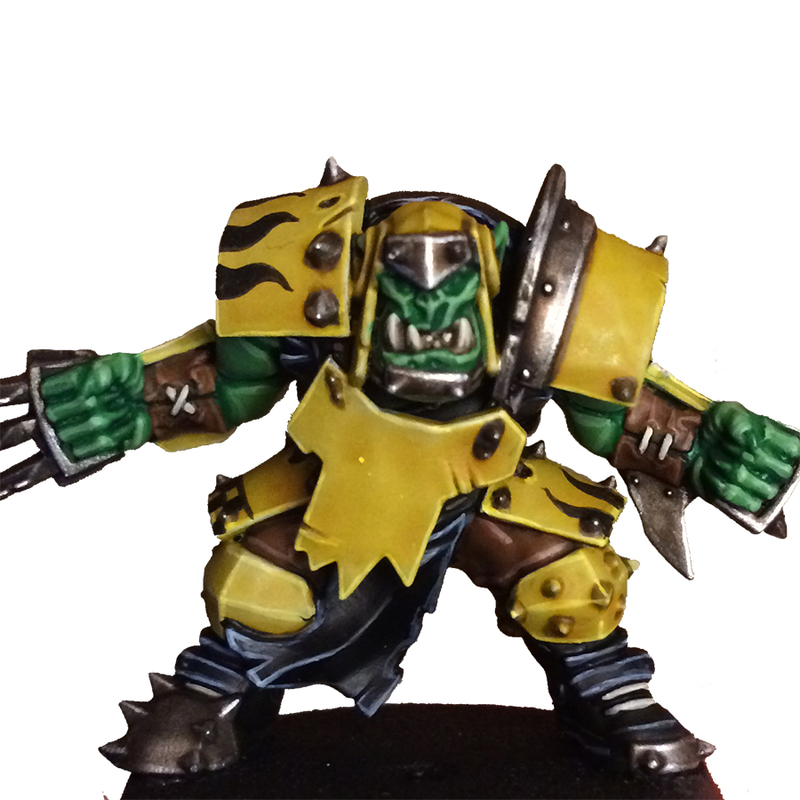 Even though I had decided that the Human team was going to be my first painted team for Blood Bowl I decided to give one of the Orcs a go. After a bit of back and forth on how I was going to paint him I settled on a scheme similar to the Ironjawz from AoS. Even though Blood Bowl takes place in the Old World, or a version of it at least, I decided to make my Orcs come from the Mortal Realms, or perhaps they just somehow heard of the legendary Boss Gordrakk. 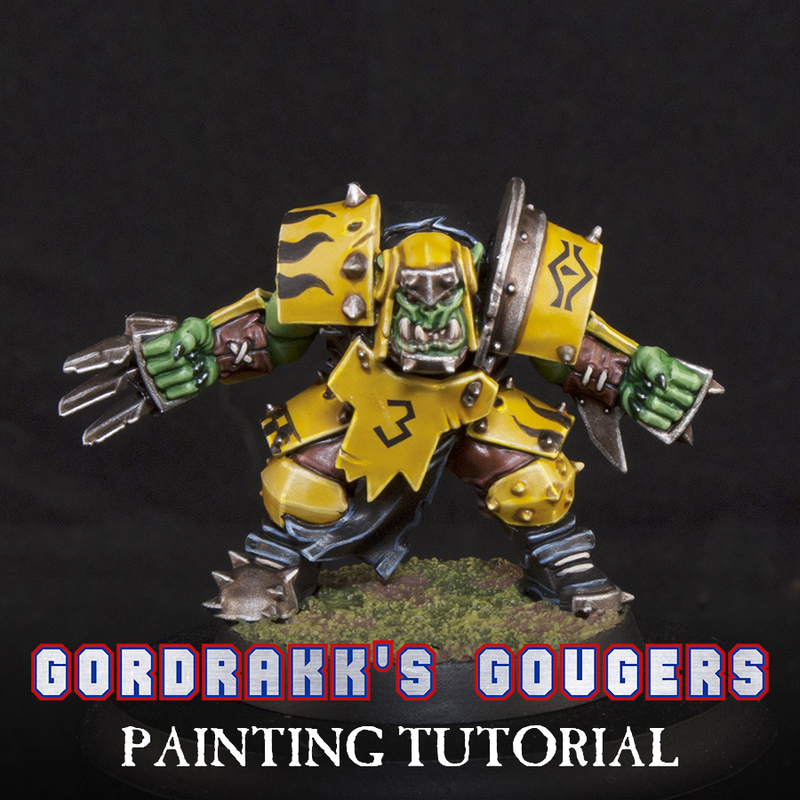 Appearing in a flash of light through a strange tear in reality, Gordrakk's Gougers take to the pitch to crush their opponents into the turf. 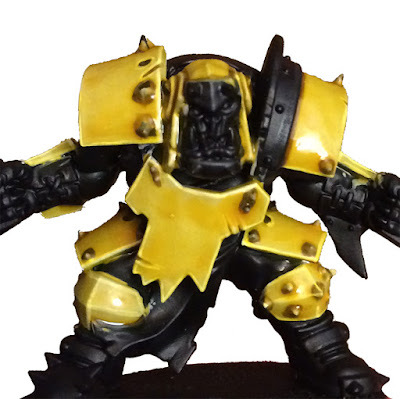 You may notice that part of this borrows from my Imperial Fists painting tutorial, so it was nice opportunity to see how this technique looks when not used on a Space Marine and with a few more colors added in. All of the armor is base coated with Rakarth Flesh. This may take two to three layers to get a solid coat. 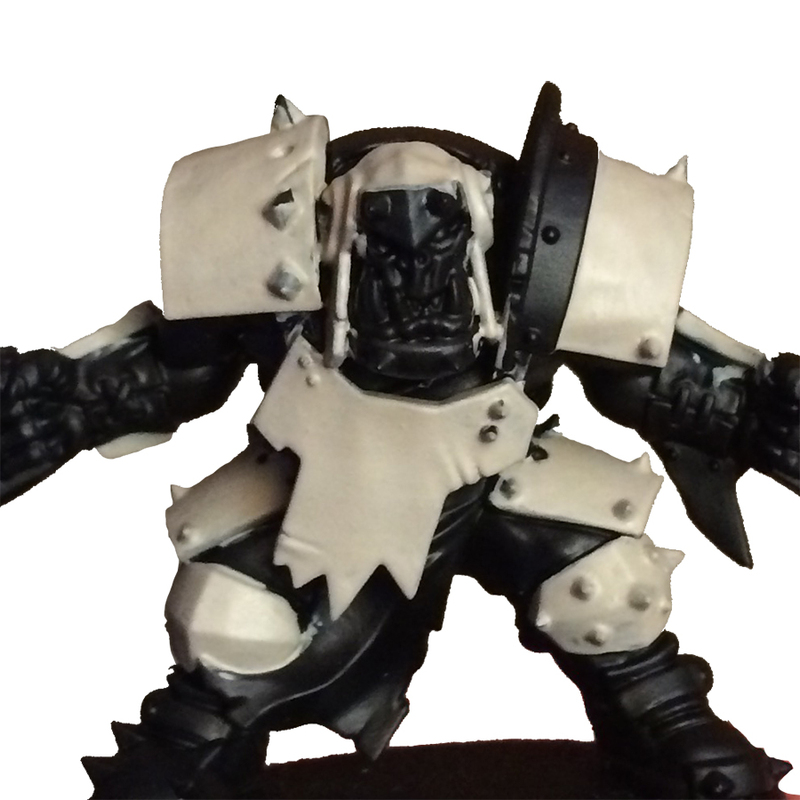 I then carefully painted Agrax Earthshade exactly where I wanted it, primarily around any rivets or spikes, and in any cracks or scratches. 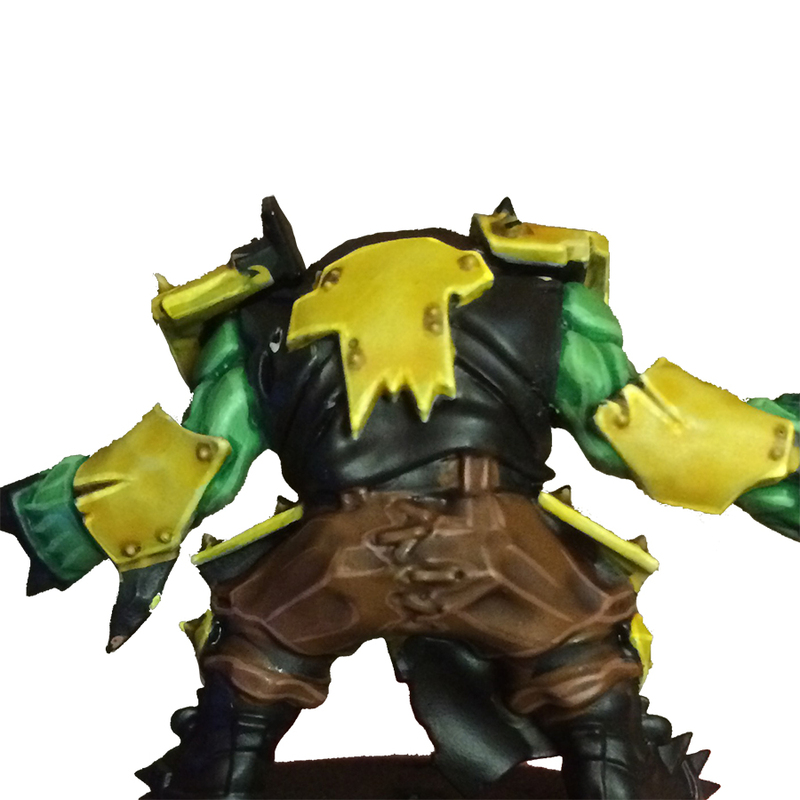 Be careful to minimize any clean up, but if it get's messy anywhere just go back with Rakarth Flesh and tidy up. Edge highlight all of the armor with White Scar. 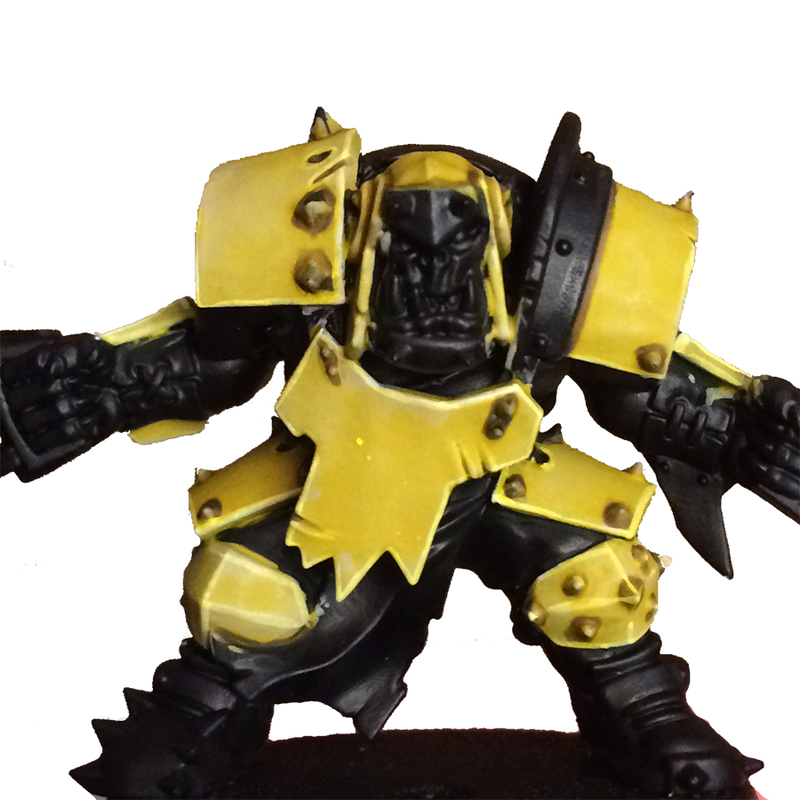 I then glazed all of the armor with Lamenters Yellow. 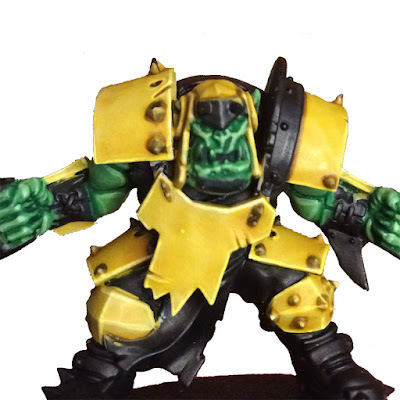 Finally I used a wash of Casondora Yellow to enrich the yellow a bit more and add some more shading to some the more shallow areas that didn't get any Agrax Earthshade. 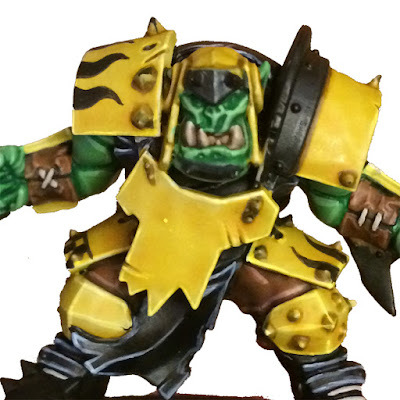 This was just painted all over the armor. All of the skin was base coated with Warboss Green. This may take a layer or two to complete. 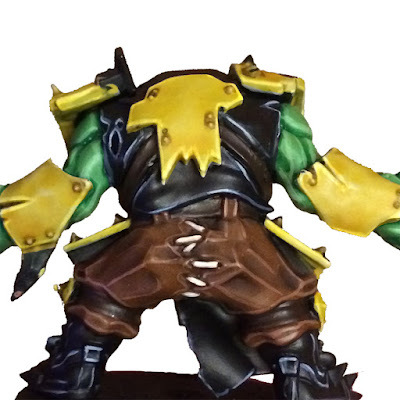 The skin was then shaded with Biel-tan Green. On the arms I carefully painted it into where I wanted it to define the muscles. This avoids a lot of clean up later since the arms are mostly large flat areas. On the face and hands I just applied it all over since they are more textured. I then went back over the skin with Warboss Green to redefine it and clean it up. The shade was left showing in all of the recesses. 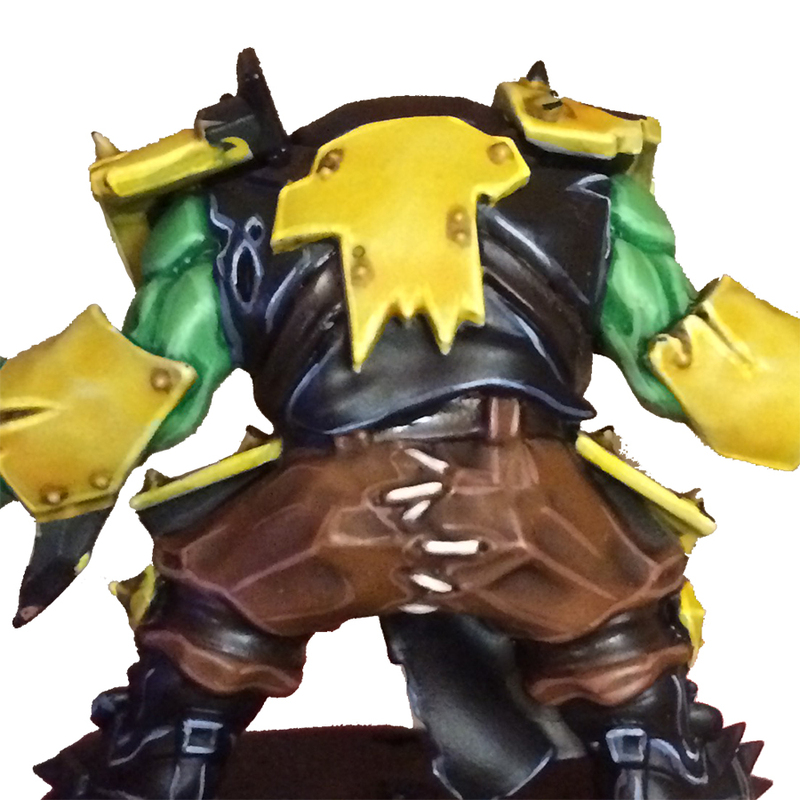 Lastly it was highlighted with Skarsnik Green. I picked out the edges of the muscles, as well as the fingers and the facial features. 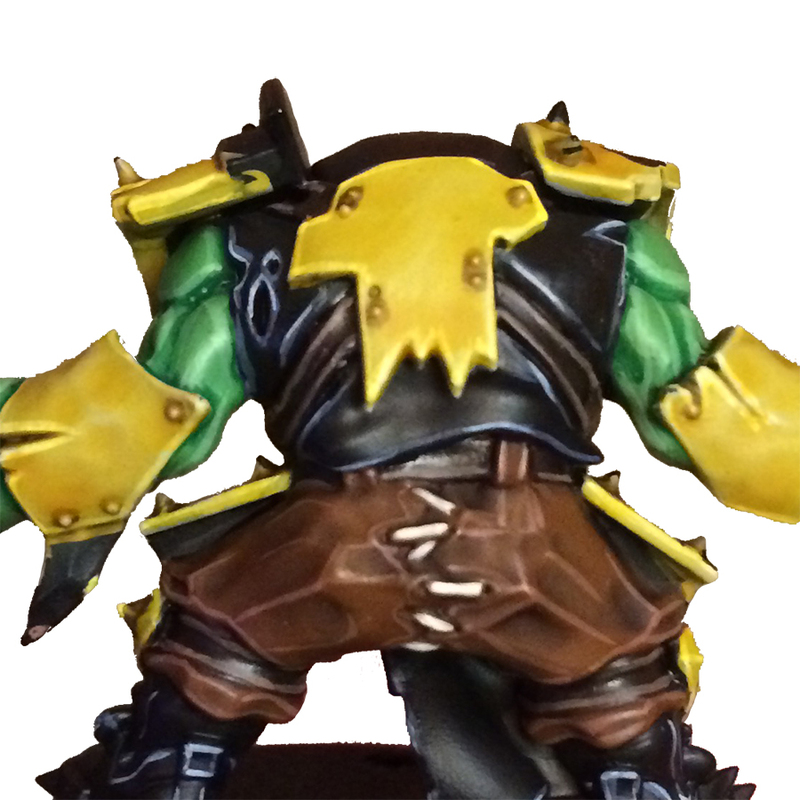 I base coated the pants with Mournfang Brown. I decided to also paint his leather gauntlets in the same manner. I finished off the pants with a line highlight of Bugman's Glow. I just picked out all of the folds and edges with the color. 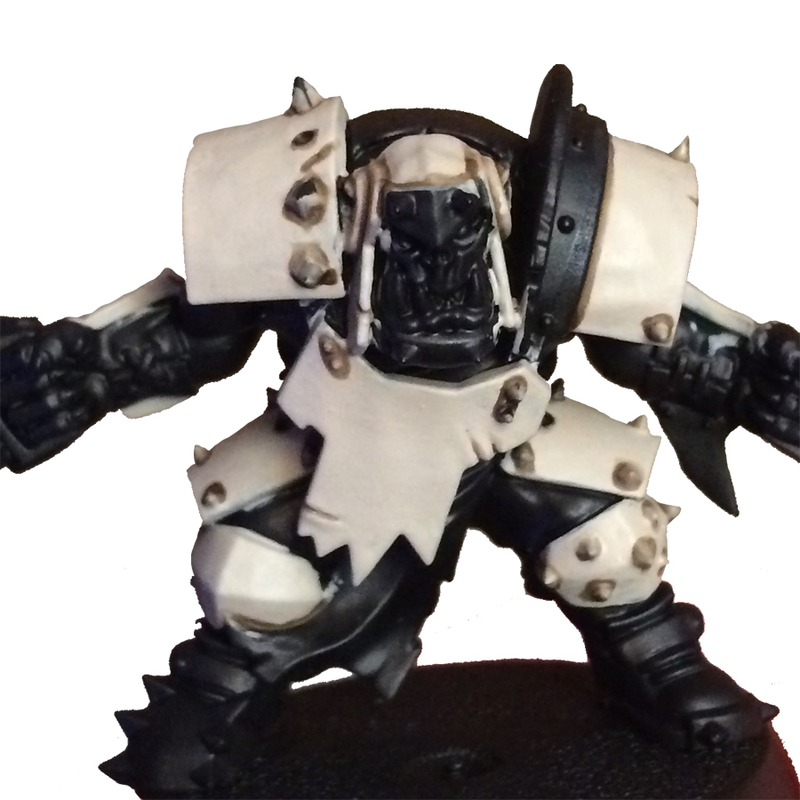 For all of the black areas, primarily the shirt and loin cloth, I went back over with Abaddon Black to tidy it up. 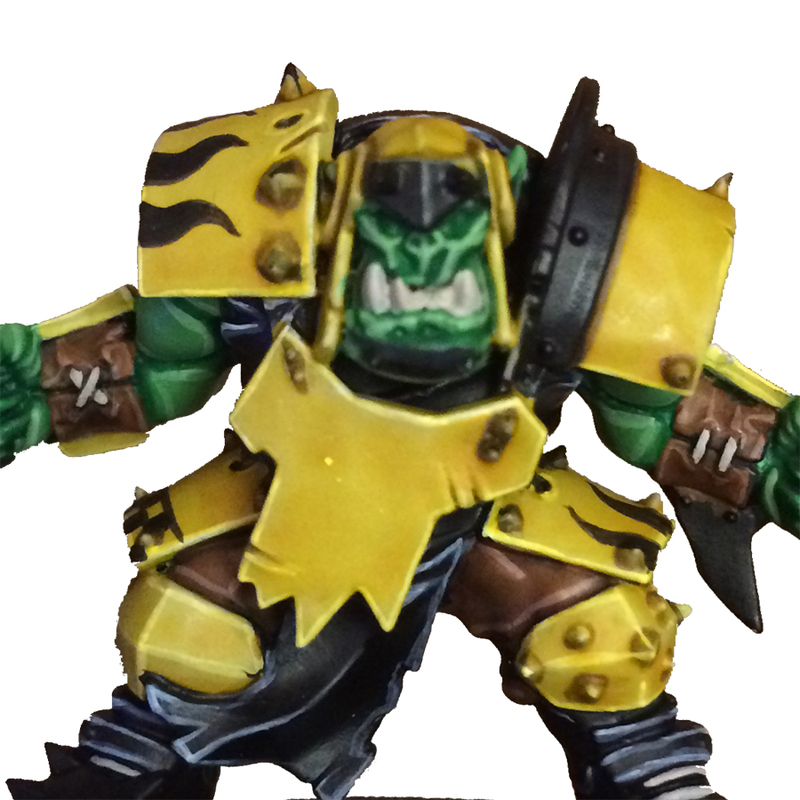 I also painted some iconography on the armor in a few places. 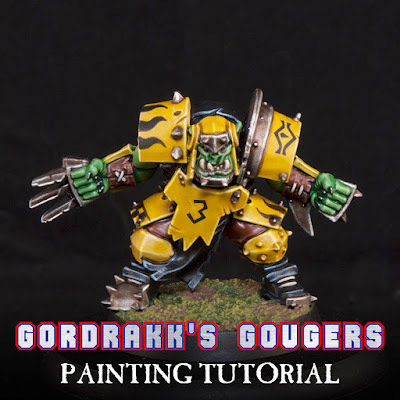 Just make sure you have a good point on your brush and carefully paint the outline of each design before filling them in. Thinning your paints a bit more than normal definitely helps here. 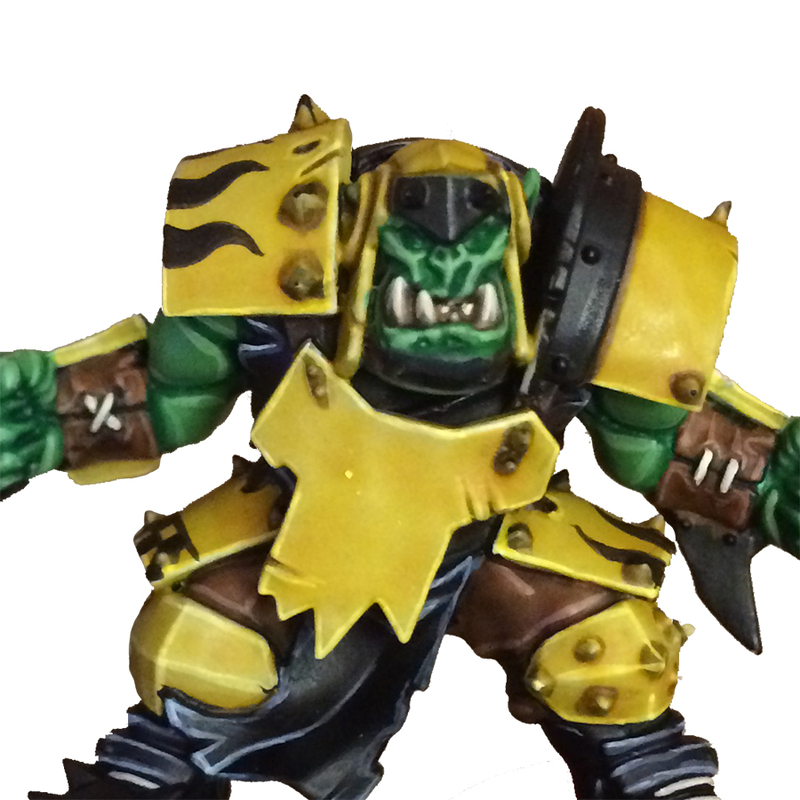 I then line highlighted all of it with The Fang. 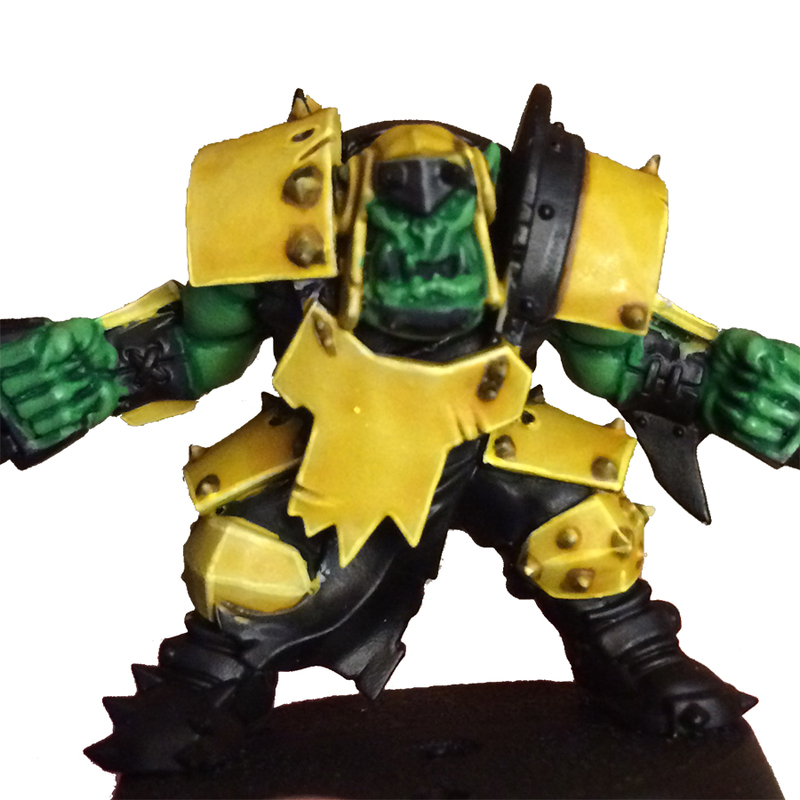 This was then followed up by a final highlight of Ulthuan Grey on a few select areas to make it pop more. 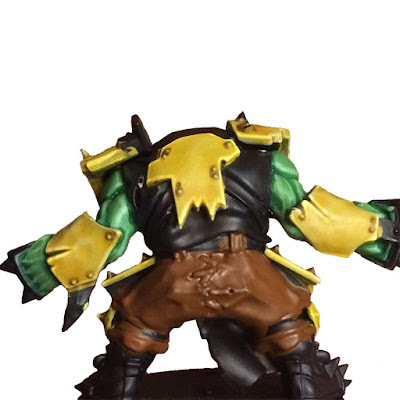 All of the laces and teeth were base coated with Rakarth Flesh. 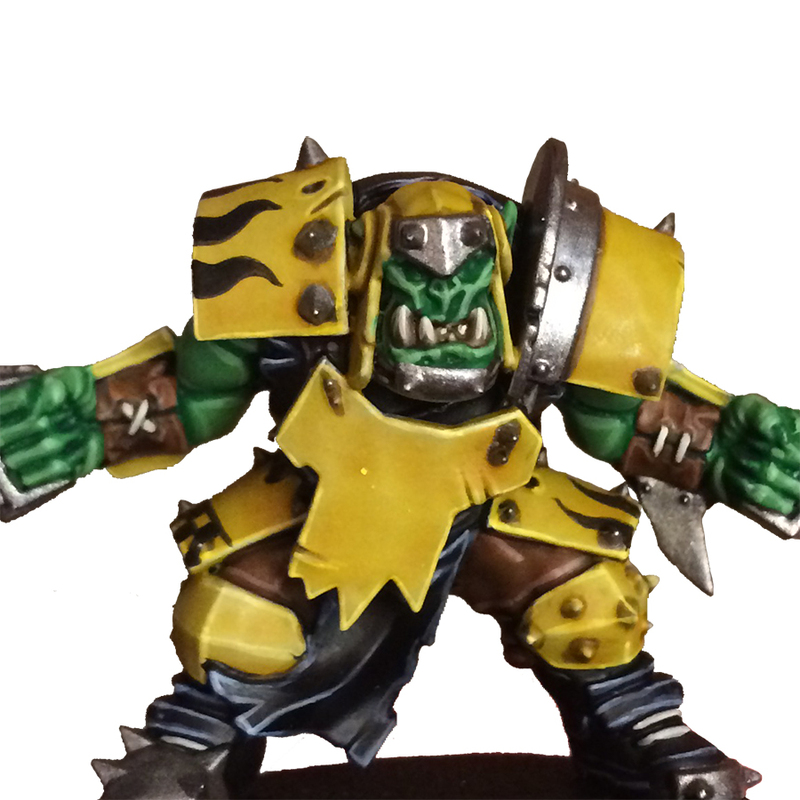 Only the teeth were given a wash of Agrax Earthshade to shade them. Lastly the laces with picked out with Screaming Skull and the teeth were highlighted with it as well. I did this in a striated pattern so it looks more natural. All of the leather straps and belts are painted with Rhinox Hide. 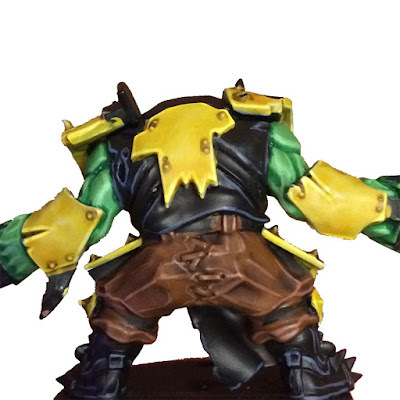 I then used Nuln Oil to shade them, focusing mostly on where the straps met other objects. 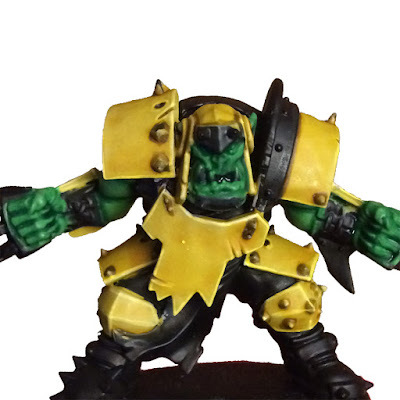 They're all finished off with a line highlight of Gothor Brown. 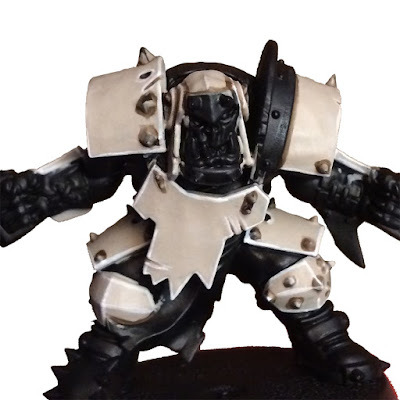 All of the metal areas were base coated with Leadbelcher. They were then all shaded with Agrax Earthshade. I used this instead of Nuln Oil so it looked suitably dirty for an Orc. I picked out the edges of the metallic areas with Stormhost Silver. All that was left were a bunch of smaller areas. I painted his nails Abaddon Black and shaded his eyes and bottom lip with Carroburg Crimson. 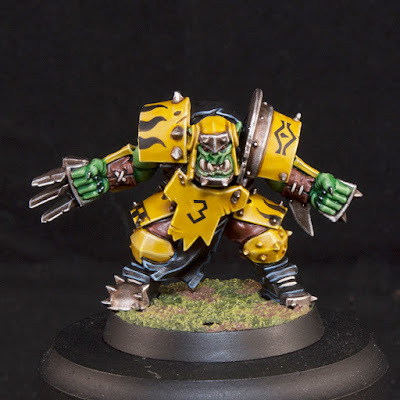 Lastly the nails were highlighted with a line of Caliban Green, followed by a smaller highlight of Warboss Green and a final dot of White Scar. The eyes were picked out with Mephiston Red. 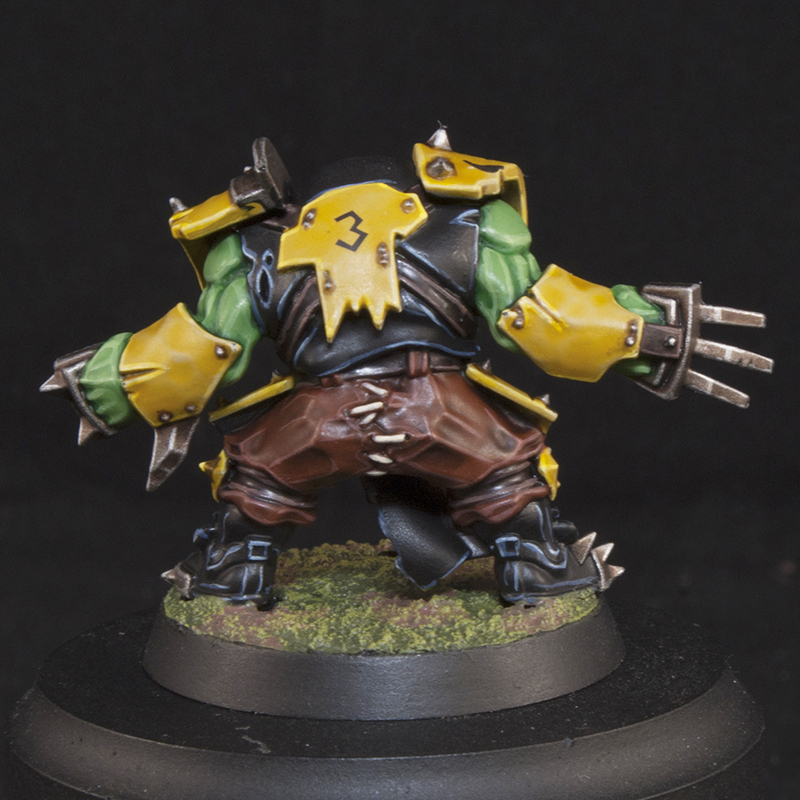 To finish it off the base and the transfers were done the same way as my Human team, and that's it, you're all done! 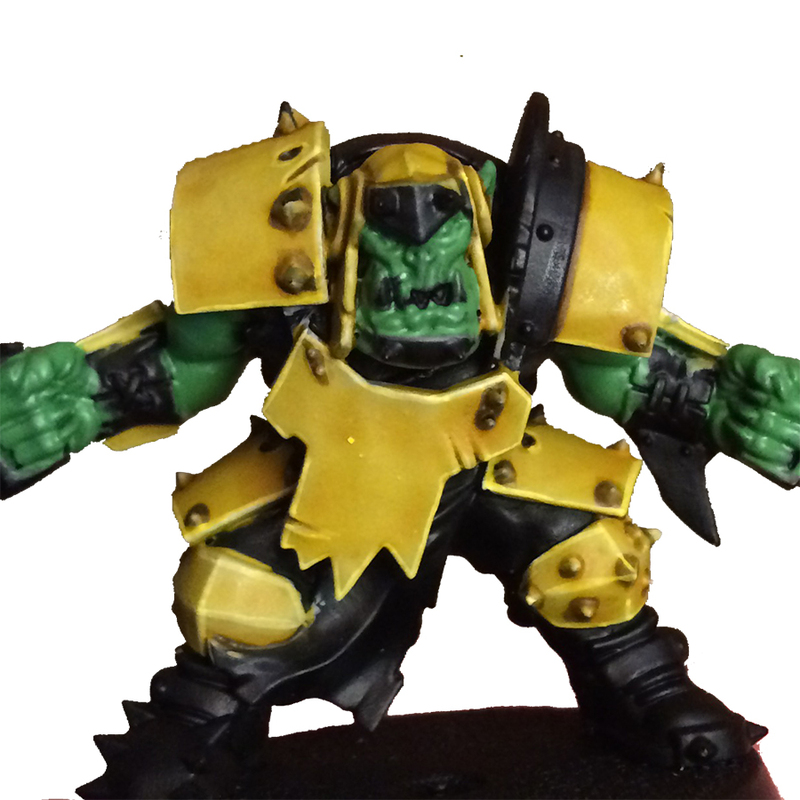 I really liked how this guy turned out. 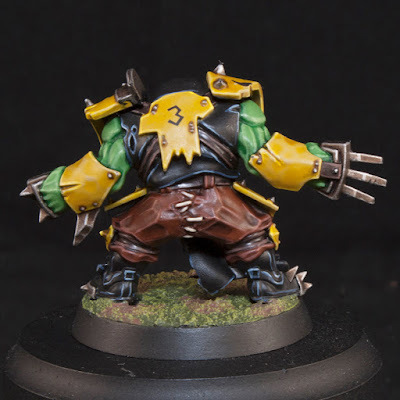 Unlike my Human team I didn't paint all of these at once, and only painted this one for right now. 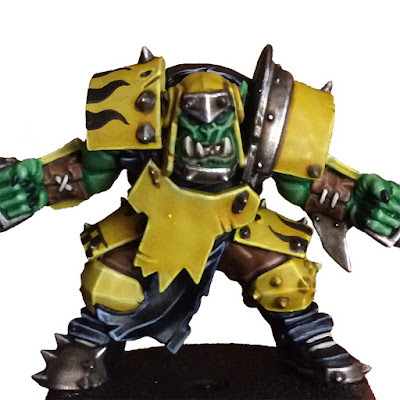 I'm pretty tempted to paint the rest of the Orcs because of how well this guy turned out, but for now I think my attention is going back towards the Mortal Realms. 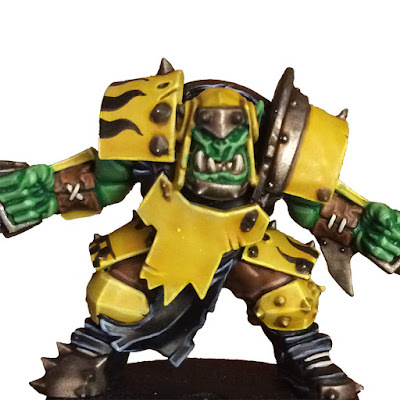 I hope this helps you with your own Orc team, or at the very least, provided you with some interesting technique to use on other models. You can watch a 360º video of the model below.